**Update: In light of Ed Stetzers recent tweet (seen below) we thought it might be worth reposting this. Who are #the15? People want to know. We want to tell them. IGNORE: The larger force, the bully pulpit, the powers-that-be, first ignore the resistance. Any answering of their critics or acknowledging their existence only gives credence to concerns and grievances, they surmise. And why not ignore them? This works with most mortal men. Most men want to be acknowledged. No one wants to be made to feel invisible. No one wants to be blocked in social media and relegated to the status of ‘untouchable.’ From our leaders who we admire and buy their stuff and attend their conferences, and pay their salaries, we want an occasional head-pat, an ‘attaboy,’ and social media shout-out. But in the SBC – and to a large part in evangelicalism as a whole – if we criticize them, we are dead to them. Ask us why our bookstore is one of the largest peddlers of heresy in the nation? You’re dead to us. Question the wisdom of enrolling Muslims in Christian seminaries? You’re dead to us. Question why we’re telling you to attend gay wedding celebrations? You’re dead to us. Ask us to defend our statement that “Jesus was an illegal alien?” You’re dead to us. You do not exist. You are cut off from your people, Israel, and out of the camp. We can’t see you. We can’t hear you. You are anathema. Oh, sure. They will say we’re blocked or ignored because we’re jerks. Suddenly, they are the civil magistrate of social media, Twitter hall monitors, the tone police. If only we would have asked the question more politely, they would certainly have answered it. The problem is…that’s just not true. Do you have any idea how many screenshots we could provide of well-meaning, polite, timid souls asking very reasonable questions of Ed Stetzer about why his employer sells Eastern Mysticism, Word-Faith, Prosperity Gospel, Anti-Trinitarian books? Do you know how many answers he gave them? Yes, you know – zero; not one. Well maybe it’s the form of media. After all, maybe 140 characters isn’t enough to fully explain profit motivation, but what about the emails in the Pulpit & Pen’s possession from Southern Baptists who have politely inquired of Lifeway and still received no response? Don’t take our word for it – send your own emails, and see the response (or lack thereof) yourself. No, their method is clear. If you question, if you challenge, if you criticize, you are ignored as though dead. In social media, this means you’re instantly blocked. It doesn’t matter if you pay their salary, you are dead to them. But you’re not only ignored from that point forward in social media, but it means that if you are in a denominational structure, forget about advancement. Forget about serving as a trustee for any entity. Forget about being appointed to any oversight committee. No, you’re persona non grata. You’re out. But alas, they can only do that so long. Sometimes, like with Stetzer, their temper flairs and they lash out. Sometimes, they simply realize that their strategy is not working. Sometimes their silence speaks louder than words, and they know it. When they can no longer control themselves and maintain their disciplined silence and shunning, they make fun. They ridicule. RIDICULE AND MARGINALIZE: Ridicule happens in different ways, and for the Christian keeping up the appearances of Christ-likeness, it is rarely a “making fun” type of ridicule, although that certainly happens (usually among the leadership sychophants, who are encouraged by gentle winks and nods and “favorites” by the leaders who keep appearances of being above the fray). What we see in the leadership caste in evangelicalism, rather, is ridicule by marginalization. It works like this, “There are only a few critics. There aren’t many of them.” This is marginalization. And this is precisely what Ed Stetzer attempted that has caused #the15 craze on Twitter. This isn’t just tongue-in-cheek whimsy for Stetzer. We realize what’s happening here. It’s what is happening every single day – those who are concerned are marginalized. We are few in number, they tell us. And to these people, numbers are everything, and so to be few in number is to be marginalized. It’s a license to ignore, but more than that, it’s a license to ridicule. 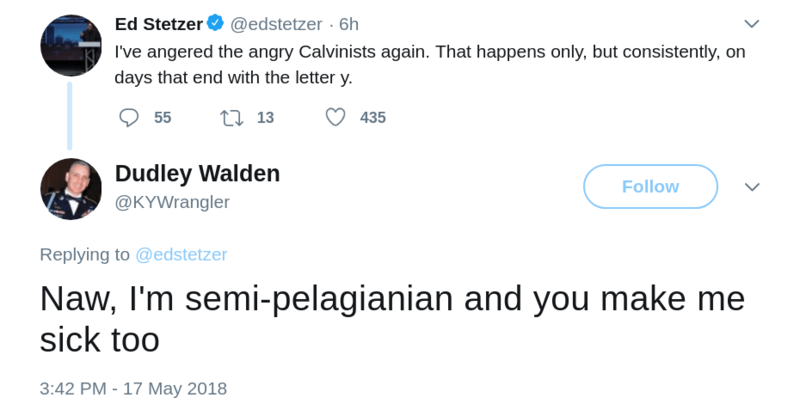 Ex-director of the ecumenical Manhattan Declaration shot tweet after tweet in my direction until Stetzer finally RT’d one, practicing textbook marginalization and providing a much-desired ‘attaboy’ for Teetsel. Yes, my tweets about Lifeway selling TD Jakes and other anti-Trinitarians, Word-Faith pastors and pastrixes, Eastern Mystics, and Heaven Tourism sound exactly like Westboro. You see the strategy here, don’t you? Ah, those people are just like Westboro! Nothing to see here, evangelical – move along. And then, Teetsel takes a jab at the number of my Twitter followers (I suppose he does not know that this is a new account, my original account is @PulpitandPen and has more followers than his own). But what does the number of Twitter followers matter? Perhaps Teetsel doesn’t understand what ‘grassroots’ means? The snobbery from our evangelical overlords is truly overwhelming. After all, there are “only 15” of us. We don’t have as many Twitter followers as our evangelical celebrity overlords. So then, is our point invalid? But of course, what the rest of #the15 need to know is that people are listening. The Pulpit & Pen Program regularly has more listeners than Mohler’s The Briefing. The Pulpit & Pen website is regularly higher in page rank than many of the more popular Southern Baptist blogs and higher than that of some of our more notable leaders. Say whatever you want, people are listening. That’s reality. And the fact is, there are more than 15 of us. While Stetzer conducts focus groups and statistical studies and polls to determine the state of evangelicalism, the church is being drained of its most committed Christians. The masses are simply sick and tired of the shenanigans of the evangelical establishment, and we are leaving. Those who disparage #the15 need to figure out there’s more of us than what they can imagine. It’s just that many of us leave quietly. We are often surprised, given our knowledge of how many have already left Southern Baptist and other mainstream churches for greener pastures that the intellegentsia doesn’t see it. Perhaps its the blindness of power that they actually think there’s only a few of us. History books blame the aloofness of the European monarchies that led to their inability to function in light of reality on inter-kingdom inbreeding. I’m not sure about that narrative, considering that we see the same thing demonstrated in evangelical royalty today. They simply cannot grasp that the average regenerate member in the pew is not happy at their denominational leaders’ pandering, patronizing worldliness cloaked in a religious facade and done in the name of evangelism. ATTACK: Sooner of later, the ruling class perceives that marginalization and ridicule simply doesn’t work. People begin to figure out that the criticism doesn’t go away just because the critics are ridiculed. And so, they attack. In defense of Stetzer (without defending him from the actual criticism of peddling heresy, of course – because he can’t), the sycophant goes on the attack. Notice that we called no names when asking Stetzer to account for what his employer sells and he personally promotes. This is how #the15 are often treated – attacked and called names for, ironically, not being nice enough. Stetzer’s approach is interesting, but not altogether unique. Stetzer here plays the victim, while issuing backhanded insults toward those asking him to answer a single question that he refuses to address. Not only is Stetzer fishing for sympathy (and throwing some pretty detestable low-blows that some of his supporters even rebuked him for) but is declaring criticisms to be “sinful actions.” Stetzer could tweet angry and unfair attack after attack, but not a single tweet in defense of the long list of heresy sold to pay his salary. People are noticing this. “You are embarrassing Jesus.” How dare you criticize me? How dare you challenge me, ye evangelical proletariat? If you love Jesus, if you love the church, you will let us continue to make millions by selling abject heresy without any interference. You will let us sin against the church, or else you are sinning. Attack. Attack. Attack. That’s the background of how #the15 came about. But who are #the15? 1. #the15 are those who refuse to be shamed into silence. 2. #the15 are those who are willingly sacrificing our own reputations among men for the sake of God’s holiness among the nations. 3. #the15 are those who will sacrifice our careers and denominational or organization advancement in order to continue speaking prophetic truth to false teachers and those who sell false teachings . 4. #the15 are those who do not mind being made fools for the sake of the Gospel. 5. #the15 are those who will not relent to ask tough questions until we receive truthful answers. 6. #the15 are those who will not be intimidated by power or Christian celebrity. 7. #the15 are those who know people are listening, but would speak even if no one were. 8. #the15 are those who know that God has not called us to success, but to faithfulness. 9. #the15 are those who know this modern day Downgrade is reality, and will warn others of its seductive appeal and destructive nature. 10. #the15 are those who, despite being ignored, ridiculed or attacked are not going away any time soon.